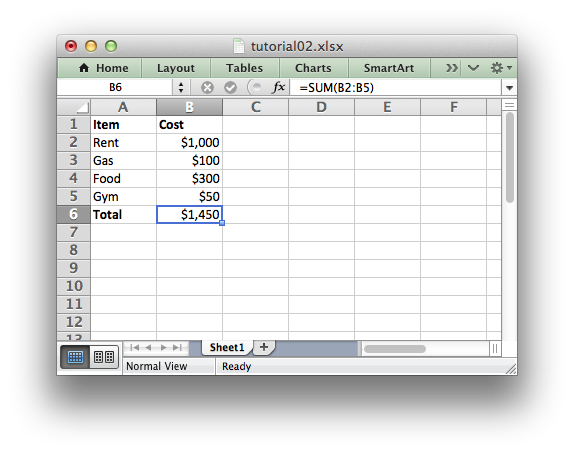 In the previous section we created a simple spreadsheet using Python and the XlsxWriter module. The differences here are that we have added Item and Cost column headers in a bold font, we have formatted the currency in the second column and we have made the Total string bold. # Create a workbook and add a worksheet. # Write some data headers. # Some data we want to write to the worksheet. # Start from the first cell below the headers. # Iterate over the data and write it out row by row. # Write a total using a formula. The main difference between this and the previous program is that we have added two Format objects that we can use to format cells in the spreadsheet. Format objects represent all of the formatting properties that can be applied to a cell in Excel such as fonts, number formatting, colors and borders. This is explained in more detail in The Format Class section. So, instead of (row, col) we used the Excel 'A1' style notation. See Working with Cell Notation for more details but don’t be too concerned about it for now. It is just a little syntactic sugar to help with laying out worksheets. In the next section we will look at handling more data types.